Since bocce is over, the Cookbook Club is now my favorite form of entertainment. The girls gathering, sharing food and wine, and discussing what worked with their recipes – or not! 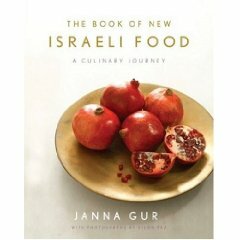 Of course I was extra excited when our chosen cookbook for November was The New Book of Israeli Food. I love me some Israeli food! This cookbook is not only rich in historical information about the foods and region, it also contains amazing photography of the food and day to day lives of such an ancient place. Even if you are not a huge fan of food, this book is still interesting for the historical context it gives on the food and how the Israeli table is a conglomeration of many ancient cultures in the Middle East. Baked Lamb Patties in Tahini Sauce – Tahini has numerable uses in Middle Eastern cuisine. A base for hummus, and in this case serves as a sauce for the lamb. Complete Hummus – Hummus made from scratch in incomparable to anything pre-packaged in a store. This one was served with a special sauce made from hot pickled peppers. Tabuleh – An Arab salad using bulgar and surprise…pomegranate seeds! Spicy Moroccan Carrot Salad – A nice and spicy side. Reminded some of us of the pickled carrots served at taco trucks. Celery and Kashkaval Cheese Salad – A Middle Eastern version of the Cesar. Lentil and Vegetable Soup – Simple and fulfilling. We served in mini-coffee cups. Diana Lamb Baharat – Grilled Lamb Kebabs…you can’t go wrong! Apple, Cinnamon and Walnut Cake – Perfect for any fall meal! Flour less Chocolate and Pistachio Cake – something delicious, without the flour. I can’t wait to try many more things from this book! Yummy!